What's with all the great events on Thursdays? Don't people know I'm an old fart when it comes to going out on weeknights? It looks like I may be starting my weekend early tonight, though. If only it weren't for that pesky thing called work on Friday. This is the only monthly fashion party in town as far as I know, and I have yet to attend, mainly because I work really late on Thursdays. But I'm off early today, and I've finally got my chance! This week's fashion show will be presented by Moxie (otherwise known as Boston's shoe Eden) and 9tailors custom shirt makers. Michael Savant will do the music, and apparently some cute Boston Revolution players will be there, too. 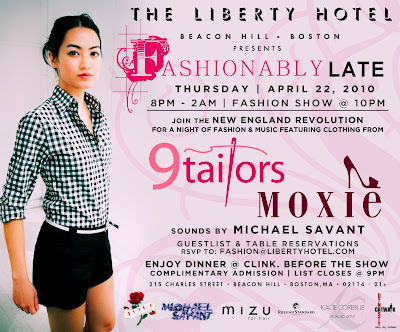 RSVP to fashion@libertyhotel.com. A week from now, a beautiful modern home in the South End will be decorated to the nines by some local talent: Dennis Duffy, Peter Griglik from Jonathan Adler, Lisa Kreiling, Andrew Terrat, and Dee Elms. Until then, you can party with the designers at the charming home shop J.E.M. and purchase tickets in advance to see the Urban Showhouse, which opens on April 29. Uniform, the South End men's boutique for casual wear, is celebrating its five-year anniversary with a d.j., drinks and 20% off all spring and summer clothing and shoes. This would be so perfect for Eric and his new clothes-horse ways if he weren't catching a ferry to Long Island in a couple of hours. RSVP to gary@uniformboston.com. Usually open exclusively to designers and industry insiders, the Boston Design Center is inviting the public into its showrooms for a luxury sample sale with prices slashed by up to 75%. The sneak preview cocktail party is free, while admission to the sale costs $10, but it's probably worth it if you're in the market for home goods. Register here. Everything at Matsu is 25% off until the end of the month. Pick up some seriously high-end clothing (think Comme des Garçons and Henry Duarte), plus covetable home accessories and gifts.